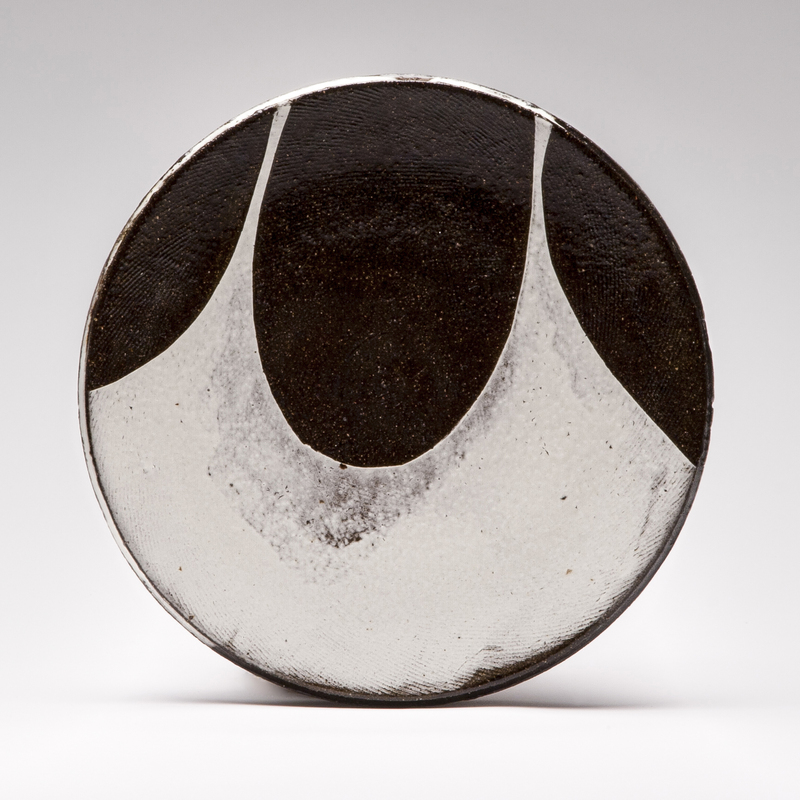 Feast your eyes on 10 of the 50 plates for sale to benefit NCECA’s 50th Anniversary. Selected by Simon Levin and generously donated by 50 artists who believe in NCECA’s mission. Although several of these plates have already been sold and are enjoying their new homes, you still have an opportunity to own a beautiful piece of artwork while simultaneously benefiting NCECA. 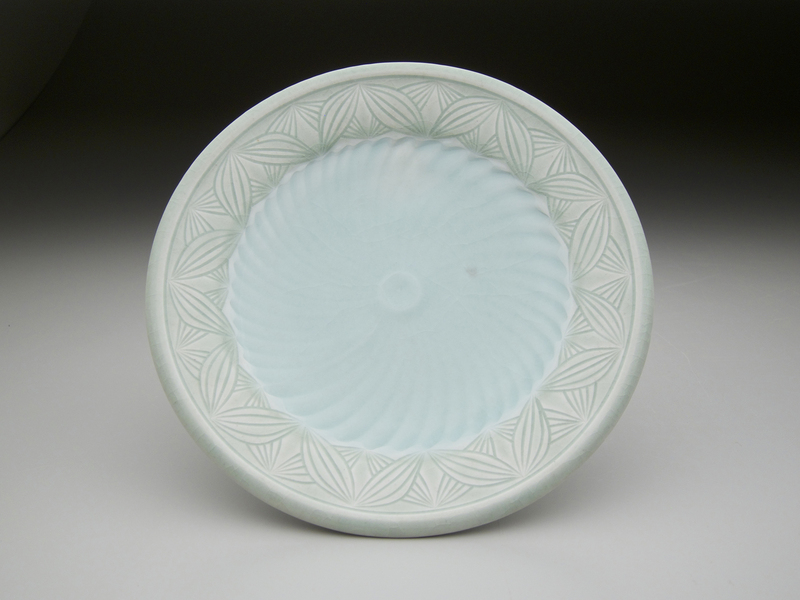 Click on any plate image to go directly to the NCECA online Store where you can purchase the plate. For myself, the essence of the art experience, is one of self-discovery and communication. In one sense, it is a very private and personal journey in search of order, reason, reality and beauty. Yet in another sense, it is a very public act in the attempt to express and share, with others, my realizations and discoveries. I make pottery that brings elegance, sophistication, and merriment to the everyday. I have a diverse range of influences and seek to marry the splendor of past eras with a modern desire for beauty and utility. My influences for these Victorian modern porcelain vessels range from 18th century silver service pieces to Elizabethan and couture clothing and from Art Nouveau illustrations to cake fondant and vintage wallpaper. Such diversity combined with my own background and distinct studio processes culminate into a unique style. Graceful forms, refined patterns, and lively colors convey a design that is robust as well as elegant and cheery. I am inspired and challenged by the art of pottery and strive to make work that is successful on multiple levels. I want my pots to be well designed and comfortable to use; to be rich with ceramic wonder, and seductive to behold; and to have reference to history and the field of ceramic art to spark the imagination. I’m drawn to the beauty and mystery of high temperature ceramics and the element of chance that occurs in atmospheric firings. Wood firing and salt/soda firing are processes where extreme surfaces can be achieved, in the subtle qualities of raw clays and the vibrant depths of a running glaze. I have a passion for painting with ceramic materials on a three-dimensional form, having the drawing unfold as it moves around the pot. I enjoy the phenomenon of the melt and the element of gravity that enters the image through running glaze. The loss of control is important, blurring the lines made with the hand. The viscosity and movement of the glaze becomes an important element in the final image. The drawings often disappear among the layers of information that become the final surface, creating depth and a sense of curiosity. I am interested in investigating the process of material degradation. I am drawn to corroded and weatherworn objects and the work I create is a reflection of my observations. I take cues from aged buildings and structures, tools and machinery. Dilapidated architecture, sun damaged signs and components left to the elements provide the surfaces I look to emulate. I try to capture the enigmatic beauty and the unperceived intricacy of this ongoing process. My work carries narratives of the human condition. The broken down forms and degraded surfaces are metaphors to describe both our fragility and our resilience. References concerning belief systems, either those of an individual, a culture or a society, can also be found throughout my work. Everything has a beginning and an end, all things age and eventually breakdown. My work glimpses in during this journey when time has made its indelible mark. My goal in making this work has been to create quiet, simple pots, which like a good meal leave a healthy, full feeling. Pots like these have been my constant companions for over forty years. They are forms and surfaces that I never grow tired of. They are rooted in ceramic history; yet, I hope they reflect a personal and individual quality of feeling. Above all, these pots are intended to be good to live with and interact with on a daily basis. They are made with others in mind. For me, good pots spring from compassion. My “technique” amounts to wishing the work well as it moves through the process of forming, articulation of the surface and firing. I try to find ways of working that respond to the only ability I have ever had, wishing the work well and silently encouraging it to “be good, be good.” I keep returning to the studio simply trying to bring as much sincerity as I can muster to bear upon the work. I describe my pots as clay sketches; improvised and spontaneous, graced with serendipitous glaze drips and thumb marks, revealing animals whose oddities are so slight that one may question their identity. Thrown fresh off the wheel, the clay is playfully modeled, utilizing the volume and plasticity of the form to give life and function to my pots. Sometimes the animal has been drawn to make and made to draw- the sum of which remains vaguely superimposed. Ideas flow when the brush, full of slip, is in my hand. I embrace images that are sweet and sentimental, which quietly teach us the virtue of patience and application. When making my pots, I try to emulate these qualities replete with compassion, humor, and risk. As food brings fullness and conversation among participants, I trust my work to do the same. Many potters stay away from plates—they warp, take up a lot of studio shelf and kiln space, and are receptacles for the debris that inevitably is cast about during firings. Customers are also more immediately comfortable acquiring a mug then a handmade plate; they can be heavier and less familiar than industrial ware. As such they tend to be on scholarship from more reliably profitable pots. But I do not want to be like a furniture maker who makes tables and not chairs—chairs being more complex yet less remunerative. To me it is interesting to make the many pots that people use. I feel a great sense of gratitude for all that NCECA offers to our community. Without a doubt, the yearly conference is part of the core foundational structure for communication between ceramic artists. This communication is critical to our collective effort to do the important work that we do. However, as the recipient of a Graduate Student Fellowship in 2011, I know first hand the influential role that NCECA can also have on individual artists lives. My own work and studio philosophy was profoundly changed because of the resources provided to me from that fellowship. For this I could never thank NCECA enough. Kenyon Hansen grew up in the Upper Peninsula of Michigan, and in 2005 received a BFA from Finlandia University. He has been an artist-in-residence at Watershed Center for the Ceramics Arts, and the Archie Bray Foundation where he was awarded the Lincoln Fellowship. 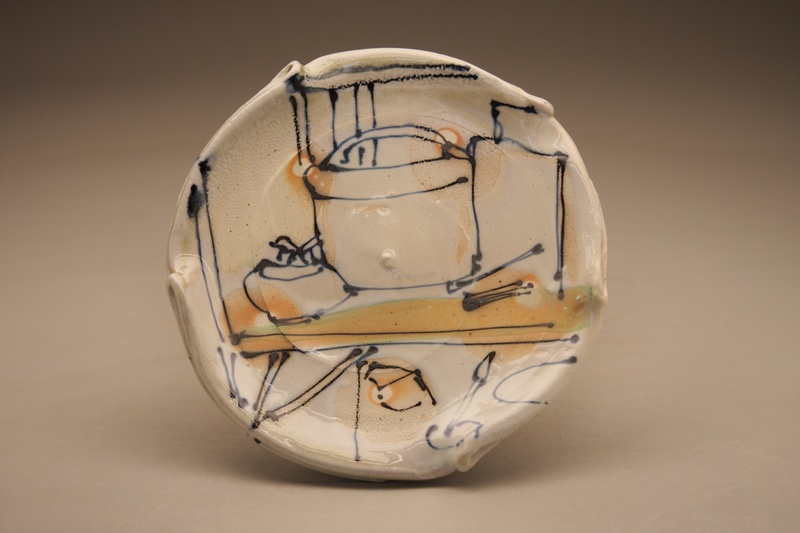 In 2013, he was selected as an Emerging Artist by Ceramics Monthly. Kenyon currently resides in Hancock, Michigan where he’s a full time potter, and adjunct instructor at Finlandia University. I believe that finely crafted, thoughtfully made pottery can contribute to a renaissance of tradition and habit. My hope is that the pots I make can play a role and be a factor in a renewal of ritual. Clay allows me to play with a physical language. When I throw or hand build, I’m engaged in the conversation, curiosity often pushes the dialog, while the desire to find something new guides me forward. I strive to create pottery that is both considered and balanced, containing a healthy dose of spirit and care. Mark Shapiro 9.25” x1.25”h Wood-fired, salt-glazed stoneware, 2013.